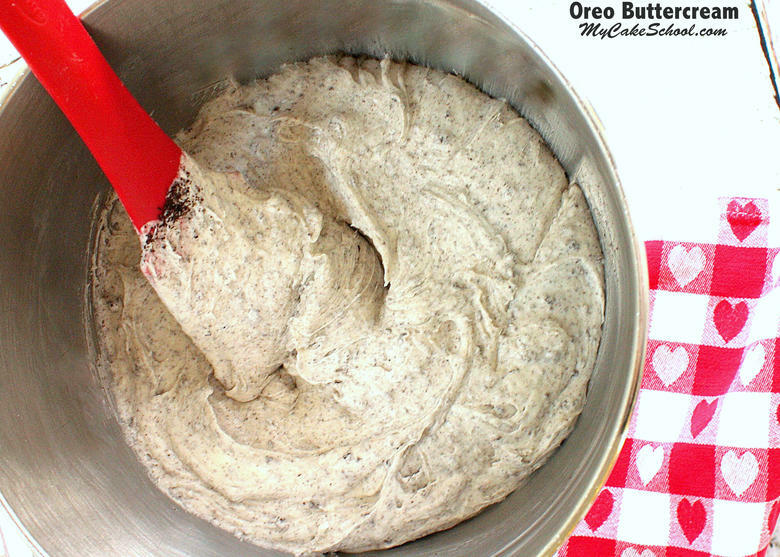 Today I’m sharing an easy recipe for the BEST Oreo Buttercream frosting! I love buttercream, and I love Oreos. So, naturally I’m head over heels for this heavenly combination of the two! We think that you’re going to love it too. Just grab some chocolate cakes or cupcakes & let’s start mixing up a little deliciousness. Add half of the powdered sugar and most of the milk. Mix at medium speed until the powdered sugar is incorporated. Next, add the remaining powdered sugar and milk and mix at medium speed for a few more minutes. I like to slow down the mixer for the last couple of minutes to reduce air pockets. What you have at this point is beautiful vanilla buttercream! Now it’s time to crush the Oreos. We use a food processor or bullet blender to really finely chop the cookies. This is because coarsely chopped Oreos have a way of clogging up piping tips or making it much more difficult to smoothly frost a cake. Don’t even think about removing the cream from the Oreos before crushing. Well, you could, but save yourself a bunch of time by skipping this step! We were so happy to find in our experimenting that crumbs made from the whole Oreo didn’t show any sign of cream–no clumps or lumps. Hooray! Next, it’s time to fold the Oreo crumbs into the buttercream and let the magic happen! As always, if your buttercream is too thick, you can add a little more of your milk. If your buttercream is too thin, add a little more powdered sugar. Oreo buttercream makes a perfect frosting and filling, and is amazing when paired with chocolate cakes and cupcakes! When the Oreos are crushed finely, it is perfectly spreadable and pipes beautifully. If you’d like to use this Oreo buttercream as a filling for cupcakes, load it into a disposable piping bag, snip the end away, insert halfway into a cupcake, and squeeze for just a few seconds to fill. Then frost as usual! 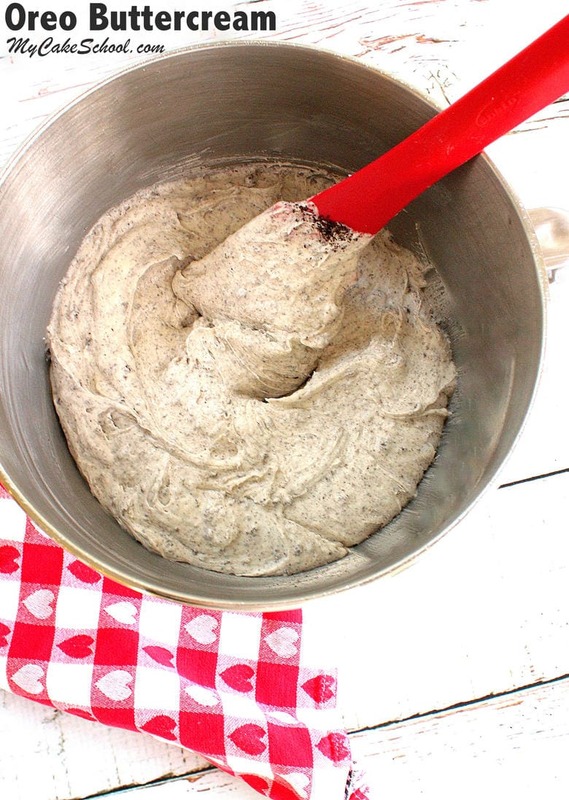 This Oreo buttercream recipe is based on our popular Classic Vanilla Buttercream frosting and it will develop a slight crust which is helpful if you like to smooth your frosting using the Viva Paper towel method. After mixing up your frosting, you’ll want to cover the bowl with plastic wrap or a damp paper towel until you are ready to use it. If it is exposed to air, it will develop a light crust while still in the bowl. This frosting is safe at room temperature for 1-2 days, or you can refrigerate even longer. The frosting becomes firm when chilled due to the butter in the recipe and so you’ll want to remove any frosted cakes or cupcakes from the refrigerator a couple of hours or so before serving. You can also freeze this buttercream in an airtight container for up to 3 months. **For a Softer Buttercream with a much lighter crust, I cut the amount of sugar from 6 cups to 4 cups, and cut the milk from 1/4 cup to 3 tablespoons, and cut the salt to 1/4 teaspoon. This lighter consistency of buttercream works great with cupcakes or cakes that don’t require the Viva method of smoothing. Thanks for stopping by! If you’re looking for more fabulous cake and frosting recipes, don’t miss our full collection of tried and true favorites in our Recipes Section. We also have a fabulous collection of Free Cake Tutorials in our Free Tutorials Section! Finally, if you are interested in learning even more about cake decorating, you should consider becoming a member of My Cake School! 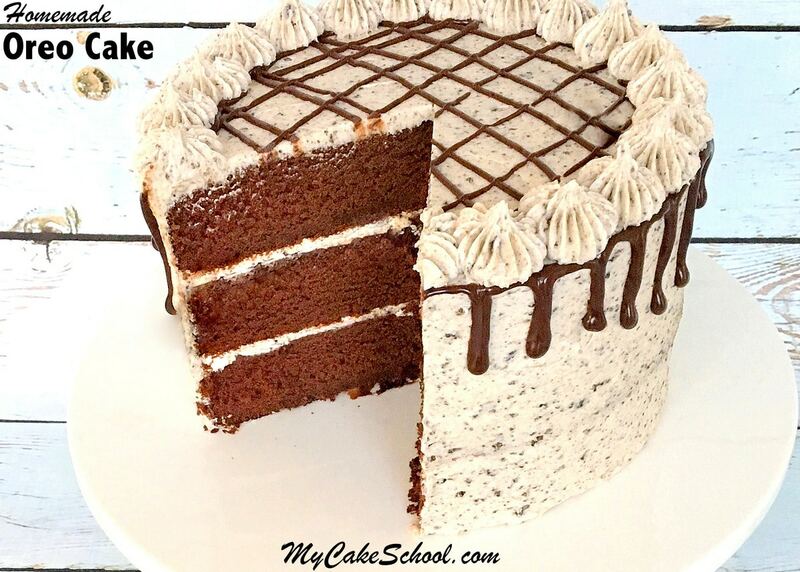 We are constantly adding new cake tutorials to our member video tutorial section, which contains hundreds of cake videos that we’ve made over the last eight years. We’d love to have you as a member! You can find the details here: Joining Information for MyCakeSchool.com. Save the easy and delicious Oreo Buttercream Recipe Here! If you love Oreos, you are going to fall in love with this easy and delicious Oreo Buttercream Frosting recipe! Perfect for chocolate cakes and cupcakes! Embarrassed to ask but… do you remove the filling before crushing the Oreos? Hi GuppyLove, there’s no need to remove the cream filling. Surprisingly, there was no sign of the cream filling after crushing the Oreos in the food processor. Can I substitute water for the milk to comply with Cottage Food Laws? Made this recipe today and it’s wonderful, so yummy! Thank you! i have two reciepes for oreo cake one puts shortning in the icing what is meant by this. ? the other says cool whipwhat is this ? How long will the frosting last on the cake before refrigeration is required to keep the frosting on the cake? Hi Rhonda, A cake frosted with this buttercream can be kept at room temperature approximately 3 days. We find that after that it begins to have an “off” taste. Hi Daisy, The buttercream recipe makes 4 1/2 cups so you could cut the measurements in half.